Having recently accomplished the ATL Challenge 39.3 that would have felt to be a mere fantasy three years ago, I supposed I had reached my body’s pinnacle and faced trouble reigniting my drive to continue seeking adversity. I almost refused to backtrack, but what could be more physically and mentally demanding yet conquerable with dedication than a marathon in infamously hilly Georgia? I ran once or twice a week to maintain my unprecedented noteworthy shape, built from three years of consistent training. Towards the end of last year, I became magnetized to the charming title of Hot Chocolate 15K and spontaneously registered, slightly worried about the event’s taking place at the peak of winter on January 25, 2015. I asked multiple friends to join the race to no avail. I purchased boxer briefs the night before the competition to prevent chafing my Tootsie Roll, which has occurred during several races. Riding my 50cc moped for nearly thirty minutes to Turner Field prior to sunrise cooled down and tensed up my muscles, and I sufficiently stretched and jogged to avoid shocking my body with the cold. Whether due to the unusually low temperature featuring disturbing winds or my lack of training, I spent two miles searching for my ideal pace. The course unexpectedly but unsurprisingly remained craggy from beginning to end, but I was never physically fatigued even after the final sprint. Nonetheless, because I could not relocate the fire that led my running career this far, I was mentally drained from the start and could not sense my typical race-day adrenaline rush. Likely as a result, my finish time fell roughly ten minutes short of my objective of 1:20:00. 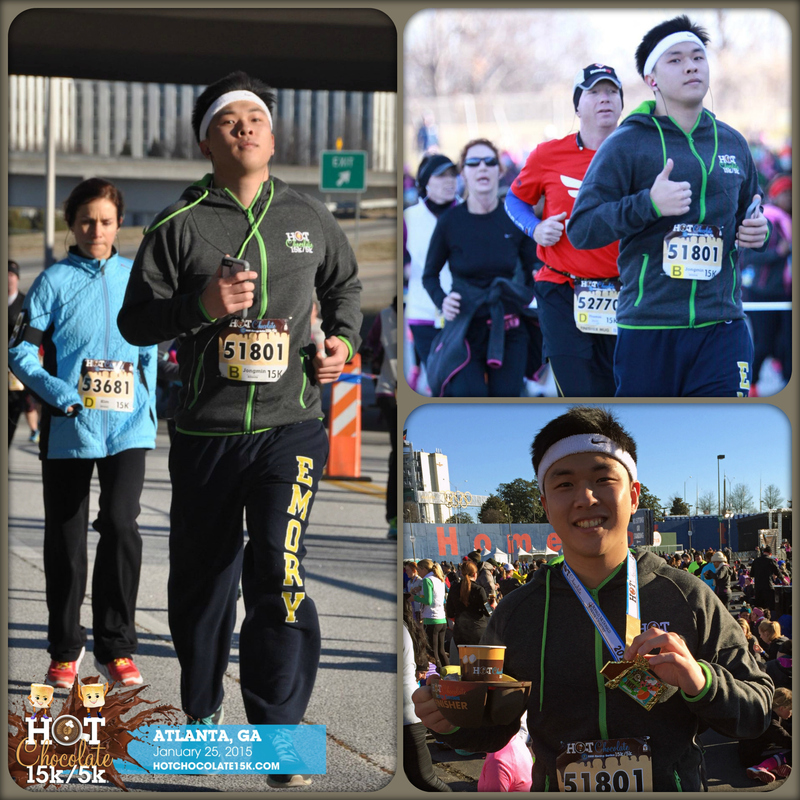 Fellow runners have been asking me if I were participating in the Publix Georgia Marathon again in mid-March, but I waited to complete the Hot Chocolate 15K first to evaluate my condition before informing them. I still do not have an answer, mainly as I doubt less than two months can be enough to prepare me for my second marathon and I am uncertain if I will still be residing in Georgia then. I would not be surprised by either decision, but participating in this insane yet familiar test may refuel my motivation for running.